A DEBIT CARD is a plastic card used for making purchases. The purchase amount is deducted directly from your checking account. 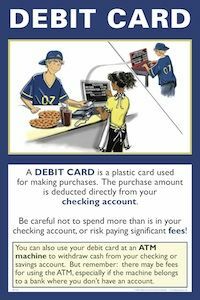 If you use a debit card, be careful not to spend more than is in your checking account or risk paying significant fees! You can also use your debit card at an ATM machine to withdraw cash from your checking or savings account. But remember, there may be fees for using the ATM, especially if the machine belongs to a bank where you don’t have an account. The main idea to get across to students is that, unlike a credit card, which is a loan, a debit card deducts money directly from a bank account, usually a checking account. Thus, a debit card acts like a check. To use the debit card, a person uses a personal identification number (PIN number). This protects a person from fraud should the debit card get lost or stolen. However, having and using a PIN number entails definite risk, because if the PIN number becomes know by an unauthorized person, that person can use all the money in your account! People often use their debit cards at Automatic Teller Machines (ATMs). To activate, insert the debit card and type in the PIN. The ATM then calls up the bank's computer to verify the balance, dispenses the cash, and then transmits a completed transaction notice. Money can be withdrawn from multiple accounts, not just a checking account. If you make a debit purchase and use your PIN number, this is an on-line transaction, and the money is deducted rather quickly from the account. If you are making a purchase with your debit card and you choose “credit” instead of “debit,” this means you are making an off-line purchase. An off-line purchase is processed through a credit card network, such as VISA, and therefore may take several days. Stores prefer that you choose “debit” when making a purchase, since they can avoid paying the 2% credit card fee. Have students draw the front and back of a hypothetical debit card. Discuss pictures with class. Post drawings on a bulletin board along with student paragraphs describing debit cards and the plusses and minuses of using them.